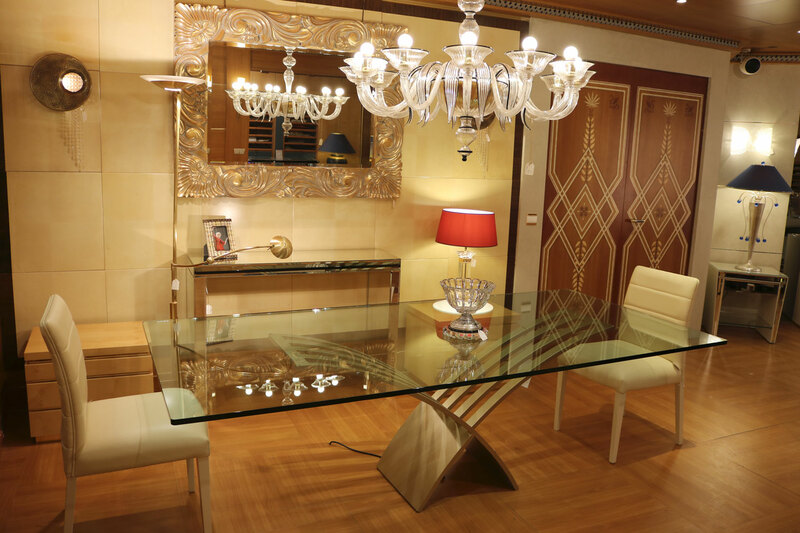 Dining table in cristal Murano glass high quality, very beautiful piece. This extra-clear glace play easily with lighting. 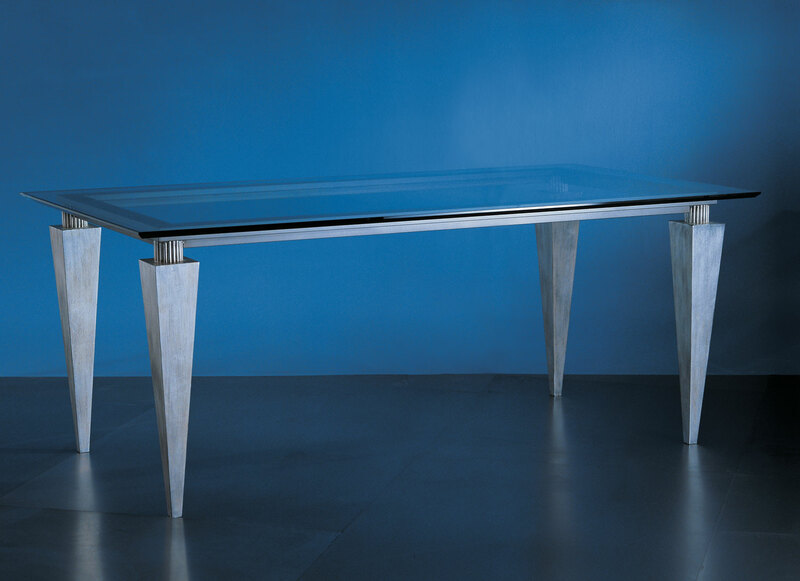 Beveled edge top glass 15 mm. 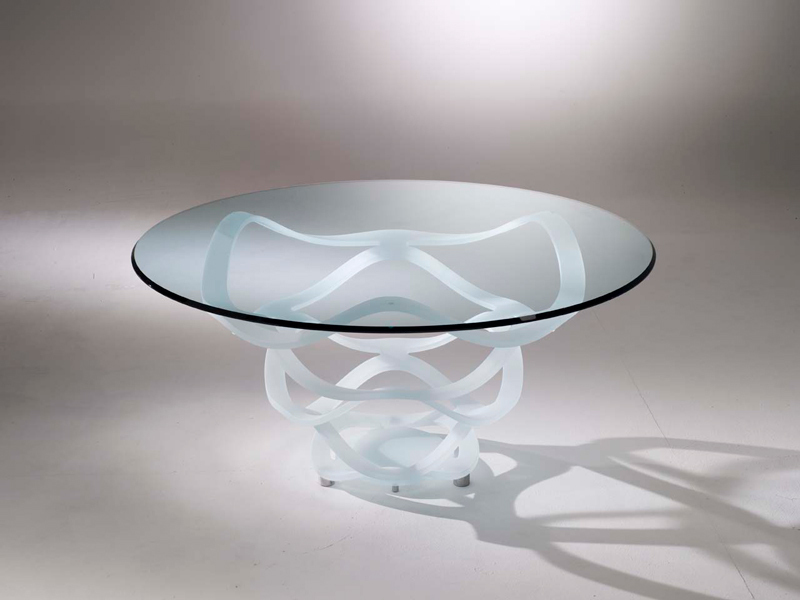 This table exist in several dimensions round or ovale. 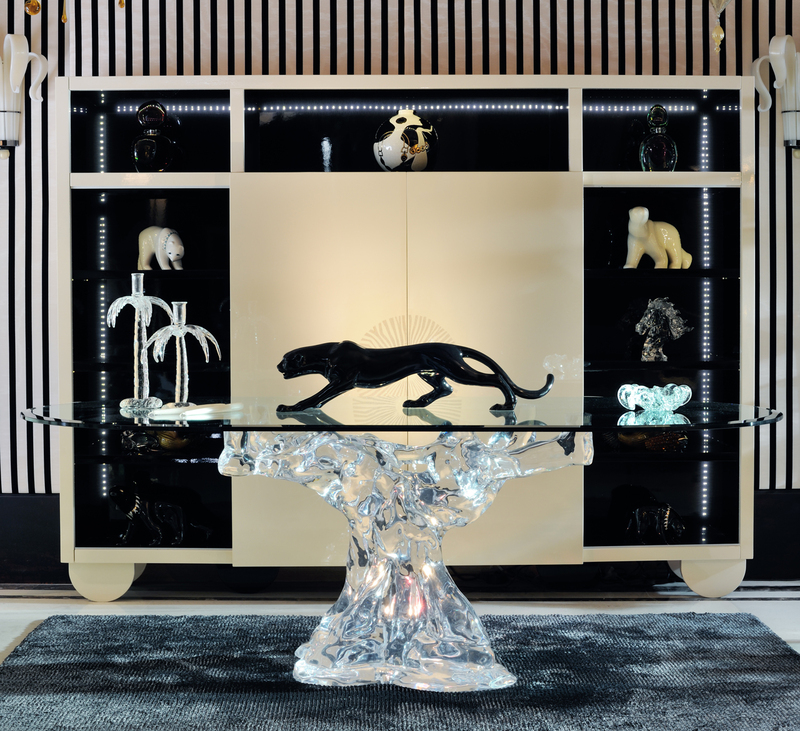 The base (leg) is in acrylic cristal shape of an Olivo tree livier sculpted and polished. 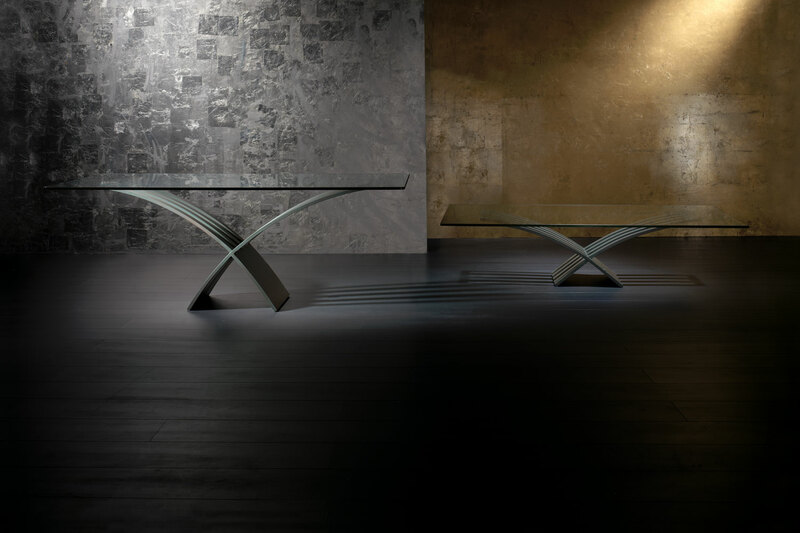 Shape : oblongue, semi-ovale beveled edge. 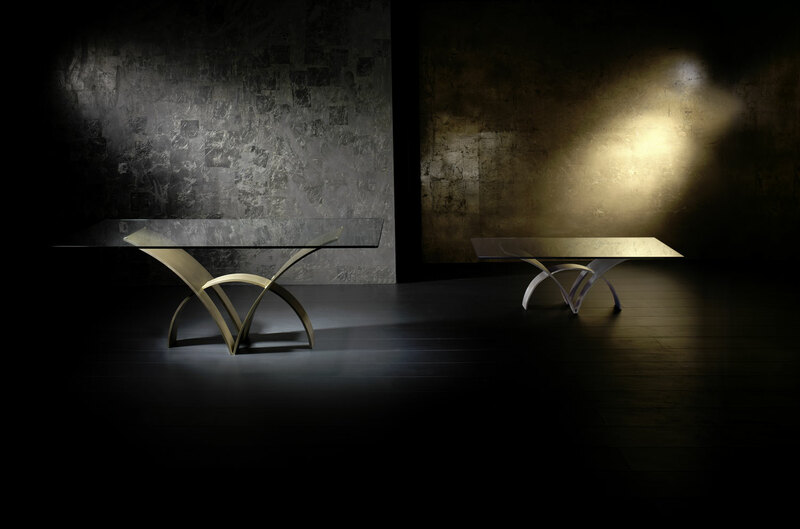 Fabulous table, that give originality and luxe in your home. Many Dimensions and finitions . Finition : shiny lacquer black and white. 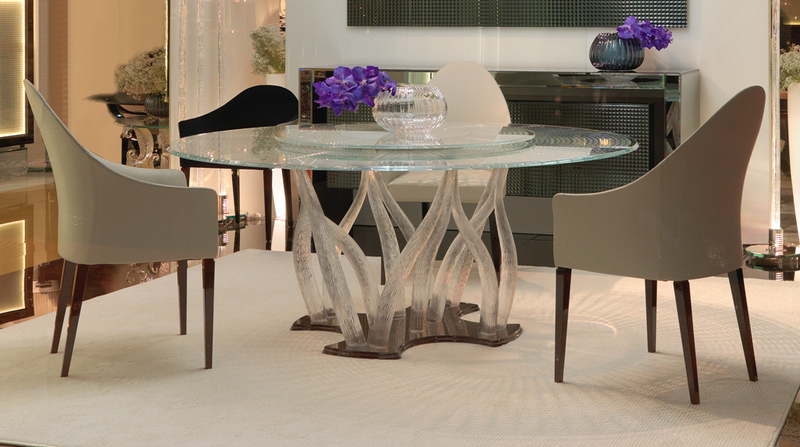 Magnificent dining table. 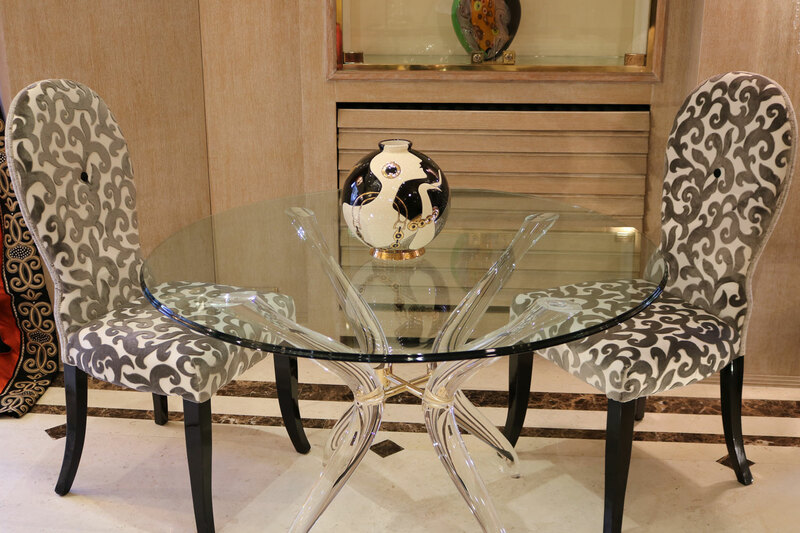 The base is in high-quality Murano glass, Top glass with or without the turning center thickness 15 mm. Can be done with or without the decor. 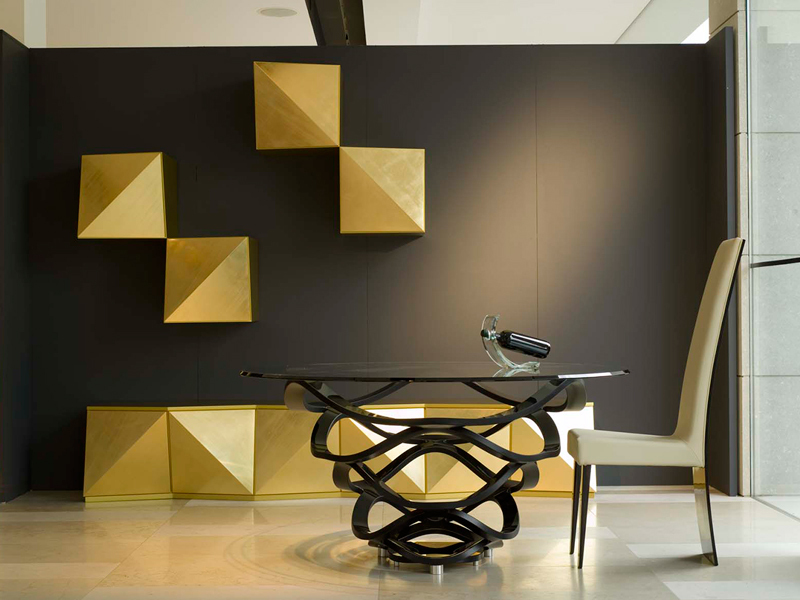 Many shape and dimensions round or ovale with many differents size of base. 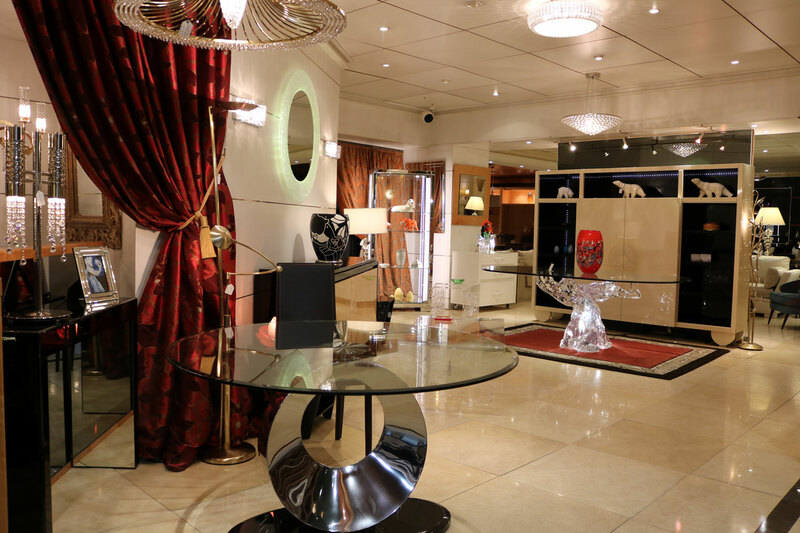 The very central moulded base is the best to place all the guests. 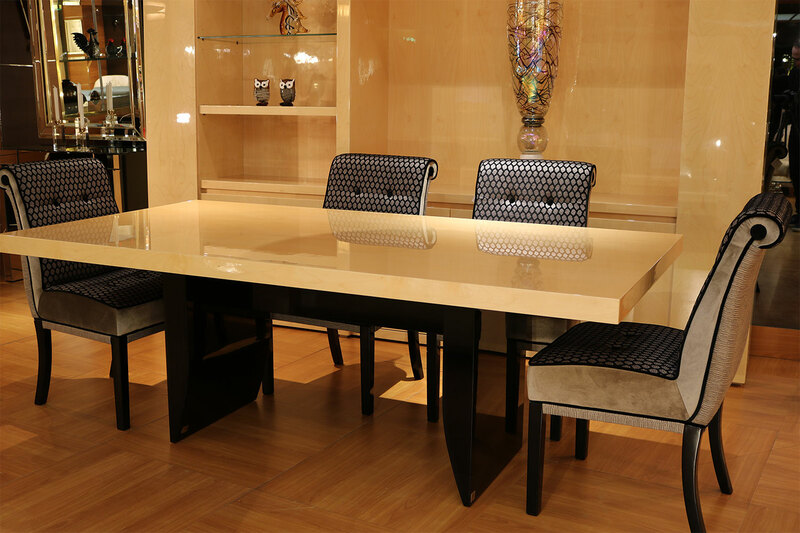 MATHIS chairs with wide bands sewings here in leather but can be in fabric also. legs in satinated lacquer all colors can be done. Dimensions : L 49 x P 56 x H92 cm. 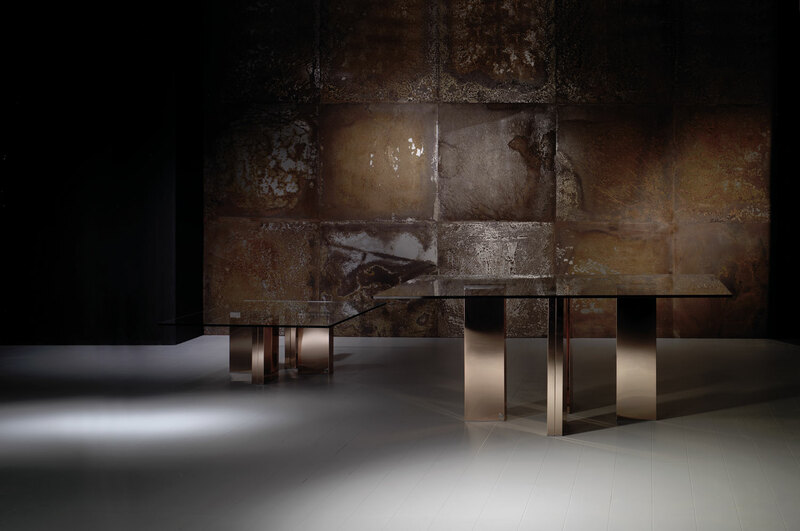 Luxury dinind table : base in golded leaves iron varnish (many other colors possible). Top in moulded border glass. Dimensions : L 200 x L 100 x H 75 cm. 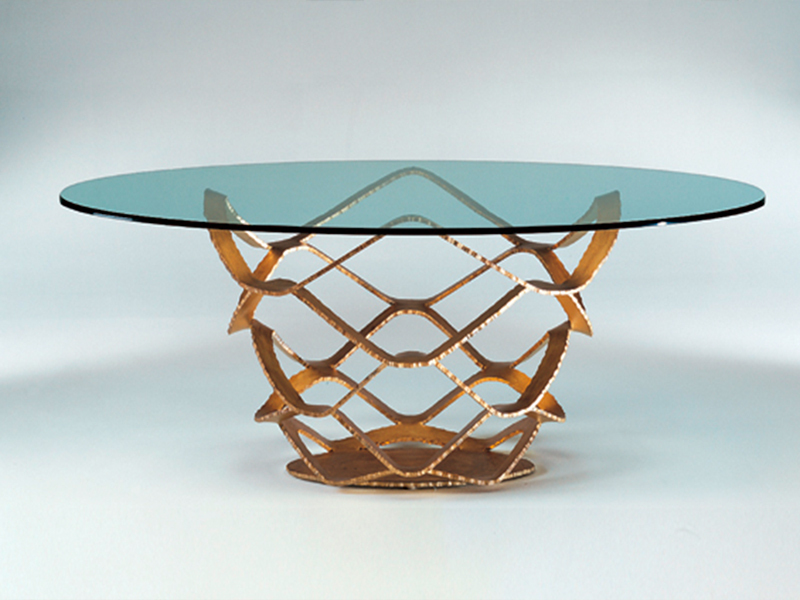 High or low Table, like a sunset moulded and fused steel, here golded finition . 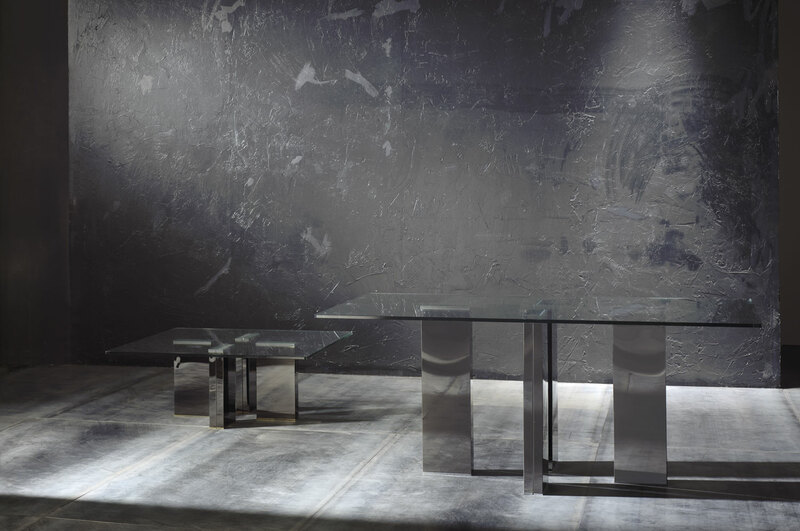 for long diners and to showcase the table. 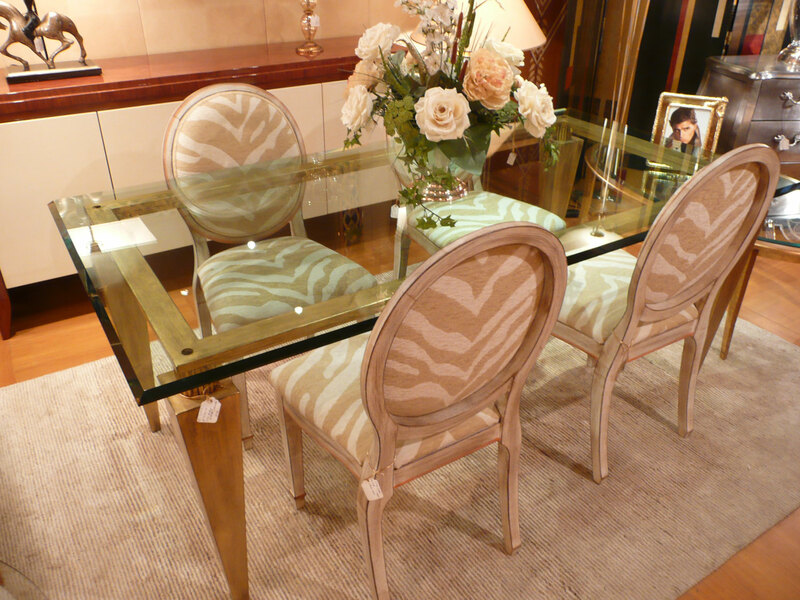 Here sycamor wood veneer and black laquer, shiny varnish. Ici meuble 3 portes , 4 étagères et 1 bloc 4 tiroirs. Toutes finitions en bois et laques possibles. Ici en placage de Sycomore et laque noire, vernis brillant. Dimensions L180 xP50x H90 cm. Piètement en marbre noir et sculpture en métal chromé. Dalle de verre bord biseauté. Diamètre 130 x H 75 cm.